After some heavy showers, the monkey caught this image from his French balcony at his hotel in Jacksonville, Florida. 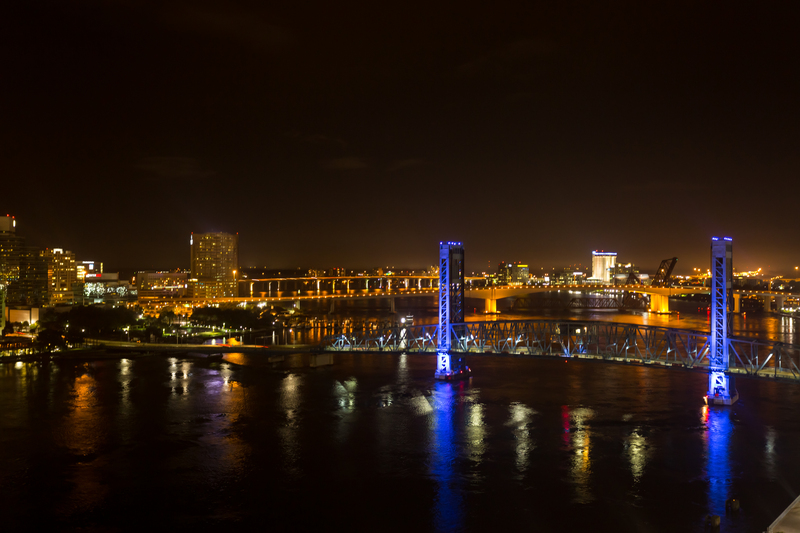 The blue bridge is the historic Main Street Bridge that spans the St. John’s River. The hardest part of taking this photo was that the camera kept fogging up. See more nighttime challenge entries at the WordPress Weekly Photo Challenge. Really gorgeous! Yes I know about camera fogging. Learned before going out in the morning to put the car in the garage at night so it was already warm. I love that blue color – spectacular! The good news is that the humidity will be leaving Florida within the next month for winter, and lots of birds are already coming back. I need something like that. I always forget about the humidity then spend half an hour waiting for things to clear up. Beautiful shot, the monkey is very talented 🙂 Perfect timing too, since I was looking for the link to the challenge. Thank you for sharing! Classic shot, but isn’t that the St. Johns River? Robin, you are solo right. sheesh, what was I thinking? It’s also the Main Street Bridge not the Water Street bridge. Can’t believe I got so much wrong in one short paragraph! Thanks for pointing this out.